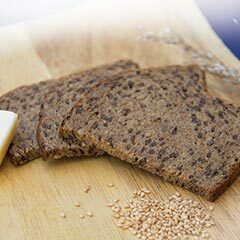 This delicious, filling bread is very similar to a multi-grain seeded bread. Enjoy toasted for breakfast with Walden Farms jelly, top with slices of deli meat and mustard for a snack-size sandwich, or enjoy on the side of your vegetables and salad for a complete meal. Each box of Dark Protein Bread contains 7 packets, and each packet is 3 slices of protein bread which would be one ITG Limited Food for the day. For extra protein or to satisfy those bread cravings, have just 1 single slice to add extra protein for the day.